Originally published on July 12, let's update our preview on PJ Fleck and his Minnesota Golden Gophers. The season started with three wins in three games. Minnesota trailed New Mexico State 10-7 early in the second quarter of its season opener, then rolled to a 48-10 win. Defensive back Antoine Winfield Jr. made a tremendous late-fourth-quarter pick in the end zone to seal a 21-14 win over a good Fresno State team (a 5-1 Fresno team at that). 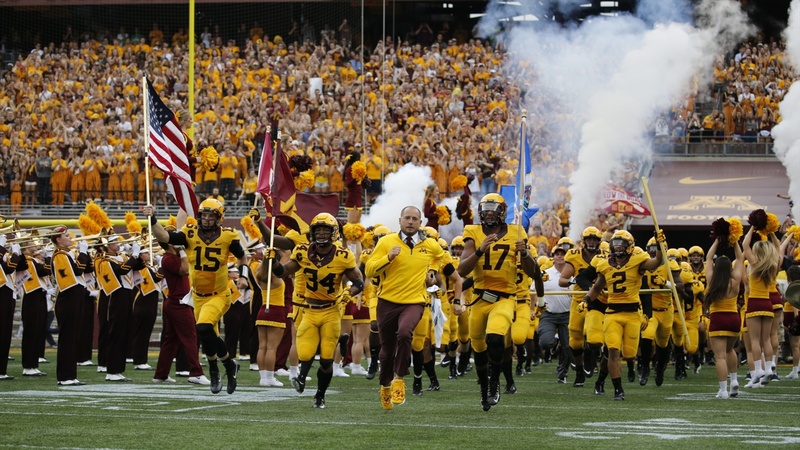 The Gophers then rolled over Miami (OH) thanks to a near-shutout from the defense. Then came Big Ten play. Maryland stomped the Gophers 42-13, Iowa won 48-31 and last week Ohio State turned a 14-10 second-quarter deficit into a 30-14 win. Consistency is the name of the game for Minnesota right now. True freshman walk-on Zack Annexstad won the starting job at quarterback and has been about as you'd expect. In the Gophers' three wins, he has four scores and only one turnover; in three losses he has four scores and nine turnovers. On the season, he's completing just 53 percent of his passes. The Gophers haven't been great at protecting him, either. Minnesota ranks 102nd in sack rate, giving up a hit on 8.5 percent of dropbacks. It's been a revolving door-type backfield with Rodney Smith starting the opener, running for 153 yards and getting hurt, freshman Bryce Williams taking over for the next two games and running at a 3.9 yards-per-carry clip, then freshman Mohamed Ibrahim for the last three games. Ibrahim's 157-yard, two-score showing against Ohio State a week ago masks two rather pedestrian games before where his longest run was 11 yards. Which is another point worth mentioning: Minnesota hasn't hit many home runs this season. The passing game ranks 95th in marginal explosiveness (explained here, basically the difference between actual and expected explosive plays) and the run game ranks 108th. The other side of the ball deserves most of the thanks for the .500 start. Minnesota is 23rd in defensive S&P+ largely because they've become a really good run-stopping unit. Ranking fourth in the Big Ten in run yards allowed per contest, Minnesota is really good in short-yardage situations (seventh nationally in stuff rate) and simply keeping you from running efficiently (12th in marginal efficiency). The pass defense started average and has regressed a bit in recent weeks (they've given up 726 yards, seven scores and a 67 percent completion rate against just one interception in the last two games) but it's the linebacking crew that has spearheaded Minnesota's surprise defensive turnaround (the "surprise" part will get explained later). The veteran three-man unit of Kamal Martin, Thomas Barber and Blake Cashman, along with rush end Carter Coughlin, make up almost 40 percent of the defense's tackles, 54 percent of its run stuffs, 61 percent of its tackles for loss and 73 percent of its sacks. The linebackers are sixth nationally in havoc rate. Minnesota has run for 300 yards in a game and failed to hit 300 yards of total offense in another two. It has been nearly turnover-free twice early and turnover-happy thrice late. We'll have to wait and see which Minnesota team shows up at Memorial Stadium Saturday. Just prepare for this, Gopher fans: 2018 might very well look worse than 2017. And 2017 didn’t look great. But that’s OK, for now. Head coach PJ Fleck lost 14 of his first 17 games at Western Michigan before the 13-0 thing happened. This appears to be the price of oars on Fleck’s boat. The light on the horizon is there. Minnesota just signed the 38th-ranked class in the country during the last recruiting cycle; no 5-stars, but 22 3-stars. It’ll take some time and development but things seem to be on the upswing. The boat didn’t capsize when the Gophers were shut out 70-0 over their final two games of the season even though it might have felt like it. There was literally no quarterback play (combined 5-for-20, 25 percent passing, 83 yards, no scores) and that’ll lead to the kinds of score-lines Minnesota saw against Northwestern and Wisconsin. And that’s where we’ll begin with this year. Really, it’s where any talk about Minnesota has to begin. It’s why ESPN’s FPI has the Gophers at 59th — 10th in the Big Ten — and starring down a 6-6 projection. There’s some good talent, but there’s still no quarterback play. Conor Rhoda and Demry Croft split the job last season. Rhoda graduated, Croft transferred. You lose the experience, but neither produced at anywhere near the level Fleck would like. Minnesota ranked 113th in passing S&P+, 115th in passing yards per play, 118th in passing success rate, 120th in passing touchdowns per game (0.75) and 125th in completion percentage (46.8). The Gophers didn’t have a touchdown through the air in the final five games of the season. Fleck signed the top-ranked dual-threat JUCO quarterback in the country in Vic Veramontes, but he transferred away in June. All that remains in the quarterback room is redshirt freshman Tanner Morgan and true freshman walk-on Zach Annexstad. That means whoever the quarterback is, they’ll have no in-game experience at the college level; Minnesota will face three of last year’s top-25 passing defenses in the country. One-third belonged to junior Tyler Johnson, and he only caught about half of balls thrown his way. Another third belonged to the trio of senior running back Rodney Smith, sophomore wideout Phillip Howard and redshirt freshman Demetrius Douglas. Smith had a 31.6 percent success rate, Howard was the team’s second-biggest threat in the passing game with 11 catches all season and Douglas is coming off a medical redshirt after missing the last nine games. The final third was everyone else. Everyone else graduated or transferred. In the running game, Smith is plenty talented (977 rushing yards last season with that passing game is an achievement all by itself) but he was the least efficient runner the Gophers had and the depth behind him is gone. A line that was good-not-great at power running (33rd in power success rate, 39th in stuff rate) returns seven of 10 from last year’s two-deep but they weren’t any good at protecting the quarterback (102nd in sack rate) and might be fighting loaded boxes early and often. This was an offense a season ago that ranked 118th in explosive run percentage and 118th in yards per play. There’s just nothing there that can provide any kind of release valve. Up until this point, the trend during this preview series has been impressive defenses that bump up the offense’s margin for error. It’d be real nice if that was the case for Minnesota this season. Unfortunately, odds are that won’t be the case for Minnesota this season. Last year’s defense struggled at preventing yards on standard downs, putting pressure on the quarterback on passing downs, creating turnovers and preventing opponents from finishing drives. You hope to be good in at least a couple of those things. You can’t be mediocre in them all. Teams that can run the ball, run the ball some more and then continue to run the ball could beat Minnesota. In seven losses, the Gopher defense gave up an average of 242.7 yards a game on 41.4 carries and 5.86 yards per carry. The Gophers ranked 107th in the country in defensive opportunity rate. When 5 yards were available to opposing offenses, they rushed for at least 5 yards 41.7 percent of the time. Teams were rarely stuffed at the line of scrimmage (just 17.7 percent of runs, 83rd in the country), had a higher-than-average likelihood of ripping off chunk runs (90th in explosive run percentage surrendered) and didn’t have to worry much about negative plays (Minnesota was 90th in defensive line havoc rate, 92nd in secondary havoc rate). Six starters will need replacing in that unit, including a former third-team All-Big Ten defensive tackle and four-year starter Steven Richardson. The middle of the defense should be fine with linebackers Thomas Barber and Kamal Martin returning — they’re the stars of the group — but depth is a serious issue in the front and the back. Defensive coordinator Robb Smith is a serious injury away from having to rely on youth in places he’d rather not. Fleck’s infectious exuberance will have things feeling fine. As long as Minnesota isn’t getting pancaked week in and week out, they should be. Even last season, three of the seven losses were by one possession. If even one of those goes the other way, the Gophers are rowing to a bowl game in Year 1. Just sit tight and prepare for a potentially bumpy ride.